For such a long time, I’ve been curious on how to open a Philippine bank account in Canada through online banking. You see one of my money-related mistakes is not opening a bank account while I’m still in the Philippines. Now I’m realizing the consequences. But I’m not yet ready to give up because of urgency and necessity. I’ll share my banking journey in this blog post that will keep on changing in time. In the following days, I’ll write more about banks in the Philippines so if you are interested on this topic, don’t forget to subscribe. Let’s clear one thing first. I’m looking for ways on how to open a checking account in any of the Philippine banks. If you are looking for something else, that can be a future blog post if you let me know. I’ve chosen and asked the best banks ranked by the Bangko Sentral ng Pilipinas (BSP). The responses are found later in the post. For now let’s face the facts. 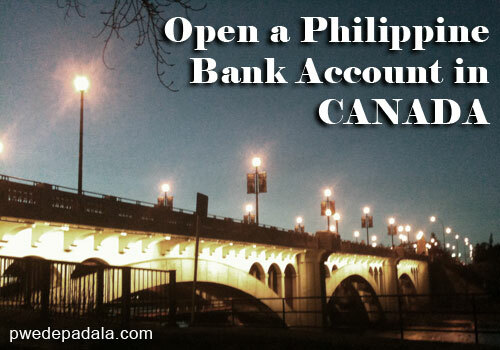 It is not possible to open a Philippine bank account in Canada online. You have to visit any branch to open a checking account. But OFWs working abroad in other countries can open a Philippine bank account through the international branches and subsidiaries. Why is it that Filipinos can open a Canadian bank account in a branch or online through Tangerine and PC Financial? I’ll be honest; I envy the Canadian policy in banking. What about the bank policy in the Philippines? As of this writing, I haven’t received a positive response from one of the top Philippine banks. The ranking has a total of 41 universal and commercial bank group but I only chose the top 10 in my research on how to open a Philippine bank account. I’m not sure if I can inquire to all the banks. Still, it’s something to consider whenever the time permits. I decided to add the international offices or branches of the top banks to give you an idea of the expansion of Philippine banks in Canada. I also added the responses I received within a day from some banks. For the rest . . . it may take forever. 1. BDO has a international branch in Hong Kong. I’m still waiting for the reply of Metrobank if it is possible to open a Philippine checking account in the international office. Update: A reader confirmed that he was able to open a Metrobank account in Canada, specifically in Toronto. 3. Bank of the Philippine Islands has no office in Canada. We may only allow account opening if the client is personally present at the branch so we may conduct the necessary verification procedure. The overseas offices of BPI are located in Hong Kong, Japan, United Arab Emirates, and United Kingdom. 4. Landbank of the Philippines has only branches in the Philippines. 5. Philippine National Bank (PNB) has overseas offices including eight in Canada. Just like in Metrobank, I’m still waiting for a reply. Out of 10 Philippine banks, PNB sent me a positive response when I’m just about to give up. (Not really though). Account opening is done at any of our branches . . . . If you are living in Canada, you can choose the closest PNB branch to open a checking account. 6. Security Bank Corporation has only branches in the Philippines. As of now all Security Bank branches are in the Philippines. If you want to open a checking account, you will need to visit any Security Bank branches. 7. China Banking Corporation has only branches in the Philippines. Allow us to explain that clients interested in our China Check Plus must at least have an established and existing banking relationship with China Bank. To open an account, a personal visit to any Chinabank branch here in the Philippines is required so that our branch officers may assist you. 9. Union Bank of the Philippines has only branches in the Philippines. 10. Rizal Commercial Banking Corporation (RCBC) has no office in Canada. Open a prepaid debit card to start saving. Open a bank account when having a vacation in the Philippines. Stay updated with the this blog post and bank regulations. Don’t let the lack of Philippine bank account hinder you to start investing. You can save (through banks in Canada) and invest (through Philippine online discount brokerage) while working abroad. With more and more Filipinos working abroad, the BSP and banks in the Philippines should offer more convenient way of online banking and learning financial literacy. Filipinos can help the Philippine economy by investing in themselves (books, courses, etc.) and by becoming stockholder to fund the projects of local companies. Were you able to open a Philippine bank account (savings, checking, etc.) while working overseas? Share your experience and thoughts. May update ka na ba kung puwedeng magbukas ng bank/chequing account as Metrobank sa Pilipinas through online? Nandito din Ako da Toronto, at gusto ko rin sanang mag-open ng account sa Metrobank, or more preferably sa BDO. I can’t find if someone is able to open an account in Metrobank online. But you can call to inquire in the remittance office of Metrobank in Toronto. It might be possible though we have different banks in mind. I was able to open a PNB account through its remittance office. Let me know the outcome so we can share it to our kababayan. Yup, puwede magbukas ng Metrobank account sa Pilipinas dito sa Toronto. Tinawagan ko yung number nila dito sa Toronto. Although they only open either a SAVINGS account or a PASSBOOK account, and not a chequing account. One can go to their office here in Toronto and bring the original copies of the listed requirements, and also their photocopies. Then they will forward these documents to your chosen Metrobank office location in the Philippines. Up to three months daw ang processing time. Nakalimutan ko na ang processing fee. Pero nominal amount lang naman. Salamat sa detailed information Johnny. My investment company only deposits withdrawals in either BPI or BDO. I wish they will open a branch somewhere close to Toronto. Just an FYI, PNB branch in Winnipeg, MB is currently not accepting any application to open any accounts. As per what the teller said, PNB is currently in the process of changing their atm machines in the Philippines so their priority is with the Philippine based customers. I’m not sure if all the Canadian provinces are on hold tho. Thanks for the information Rochelle. I spoke to the PNBRCC South Alberta manager and he said at least a month to process the account. As I understood it, I can get the account info soon, so I thought I will not have a problem giving the details to my insurance where to deposit my check, even without the ATM. I will meet with him this weekend to submit my application and initial deposit. I will make sure to clarify on that. I thought this will finally resolve my problem on how to handle the Phil check. Good luck! I hope that’s possible. Hope you can update us. Hi, PPG! Question, from the time you submitted your application, how long did they process your account? Were you able to access the account online right away? I’m more concerned that the account should be activated the soonest (even without receiving the ATM right away) because I will instruct my insurance to deposit the check to this account. Within a week I received an email confirming my transaction but I have to wait for the ATM card to set up the online account. you can call the PNB representative before you open an account to brace yourself for any outcome, good or not. I will be facing the same issue with Ms. Quitoras, my insurance policy will mature this February. Thankful for the info you shared here, Ms Pwede Padala Gal. I contacted PNB Business Manager here in Calgary and will open an account soon. And to confirm, yes, we can open an account as Canadian citizens – just not a joint account. I’m glad I found this blog! Thank you! Welcome! “We can open an account as Canadian citizens – just not a joint account.” This is news to me TwoTwenty. Heads up: It’s been 3 months and I haven’t receive my ATM. I’ll follow up again and keep the post updated. Thanks for dropping by! What are the requirements in opening a bank account if you are already a Canadian citizen? I’m having difficulty clearing out a Philippine check, a proceeds from insurance so I have to go home, open an account so I can deposit my check. You have to be a Filipino citizen to open a bank account. (Correct me if I’m wrong.) Or you could also get a dual citizenship in the Philippines or here in Canada through the Embassy or Consulate. Let me know how it goes. Have an account at RCBC, this is how I transfer money to nephews/nieces school fees. Until, I moved and had to change internet server. my email has changed. During the internet transition, me log in password was entered incorrectly – dont know how that happen, using iphone and wifi , i think was the problem. Now i am hooped! Gone to all the departments of RCBC, short answer! i was advised to visit a branch. That’s it. Explained I am in Canada and that is not possible. Oh , they are sorry for the inconvenience. To change my email – have to visit the branch. LOL!!! to change or reset the password, can be done by phone and temporary password sent to your email. How silly is that? Rosemarie as what they say, the struggle is real. I’m amazed/annoyed how the banking system in the Philippines is way behind the Internet. The latest model of cellphones and gadgets makes its way in the Philippines so fast other countries cannot catch up but the online banking or anything related to online, not to mention the Internet speed is lagging behind in the ancient era. May the odds ever be in your favour. May you keep us in the loop about the RCBC fuss.